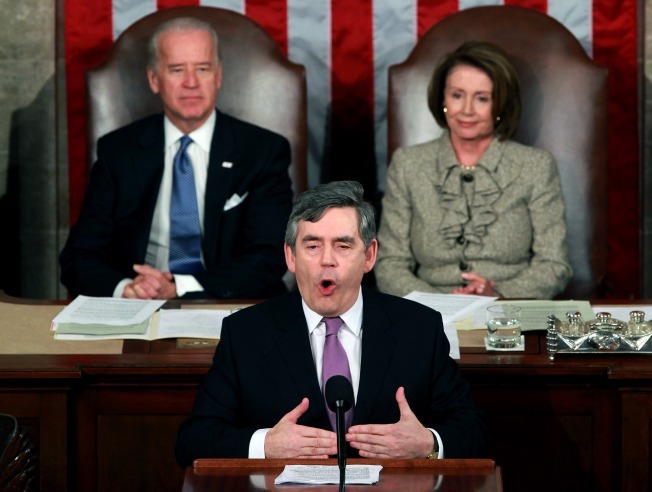 British Prime Minister Gordon Brown tries to rally a joint session of the U.S. Congress to the continued importance of free trade. -- No dual-flag press conference? -- Referring to the famous "special relationship" as a "special partnership"? The Fleet Street media in the UK and conservative writers in the US were up in arms. But lost in all of this was the "gift" that Brown offered the US -- if America is wise enough to see and accept it. The moment of substance in Brown's visit was his address to the Congress. With the entire world now following the US into recession, it might make more sense to pay attention to what Brown said rather than what goodies he didn't from the US government. Brown, recall, was Chancellor of the Exchequer (the equivalent of Secretary of the Treasury) before becoming prime minister. He's intimately aware of how the world economy works. And, in terms of finances, he is still a New Labour man. That means, like Tony Blair (and generational counterpart, Bill Clinton), he remains committed to free trade -- a philosophy that seems to be fading amongst Democrats on this side of the Pond. "An economic hurricane has swept the world, creating a crisis of credit and confidence," Mr. Brown told Congress, where members of both parties have become more skeptical of the world trading system. "So should we succumb to a race to the bottom and a protectionism that history tells us that, in the end, protects no one? No," the prime minister said. "We should have the confidence that we can seize the opportunities ahead and make the future work for us." The administration, he said, is conducting a review of trade agreements signed by the previous administration with South Korea, Colombia and Panama. He said outright that the deal with South Korea, as currently written, "is simply unfair." He added that "we are prepared to step away from that" if it is not reworked. The new administration policy statement, released by the trade representative's office last week, said Obama would seek new benchmarks for the passage of the agreements with South Korea and Colombia. South Korea has come under fire for its hurdles for U.S. automakers, while U.S. unions have said Colombia has not done enough to combat violence against labor leaders there. Though Kirk declined to detail what those benchmarks may be, analysts have suggested that they might involve, for instance, a U.S. insistence that murders of union leaders be sharply reduced in Colombia before lending support to the deal. This talk, then, is rather interesting considering that another goal of the president's is to attack world poverty. Lowering trade barriers -- making "deals" with poorer countries -- is actually the best way to alleviate that poverty. Protectionism isn't merely bad for America's GDP; it's devastating for that of Third World countries as well. Forget about DVDs and other such nonsense. President Obama and Democrats should offer a gift that keeps giving -- free trade.